Preheat oven to 375 degrees. Press the crust into a 9 or 9 1/2-inch tart pan that has a removable bottom. Place it on a baking sheet. Dock the bottom in several places with a fork. Place a piece of parchment paper over the crust and fill with pie weights, old dried beans, rice or lentils. Blind bake for approximately 15 minutes or until crust is baked through. Let cool. Reduce oven temperature to 350 degrees. Toss butternut squash cubes with 2 tablespoons olive oil and season to taste with salt and black pepper. Roast for 20-25 minutes or until tender, being careful not to brown it. Drain off any excess oil and allow to cool. While squash is roasting, heat remaining olive oil and butter in a skillet or saute pan over medium-high heat. Add the leek and a pinch of salt. Reduce heat to medium-low and cook 12-15 minutes or until very soft, being careful not to brown the leek. (Add a little water if necessary.) Add the garlic during the last minute of cooking and cook until fragrant. Take off the heat and drain off any excess fat. Let cool. 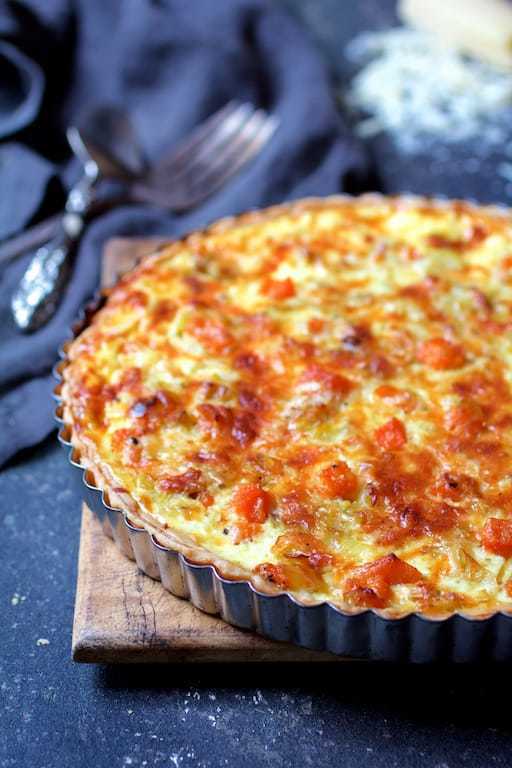 Gently toss butternut squash, leeks and cheese together and place in the prepared crust, spreading the ingredients out as evenly as possible. Whisk together eggs and half-and-half, season with salt and black pepper and pour it over the vegetable and cheese mixture. Bake for 30-35 minutes or until set and top is lightly browned.